It's Official: No Justice for Caylee Anthony! - If the Glove Don't Fit (or If It Does Fit) You Must Acquit! The American justice system has once again failed. Caylee Anthony, a murdered 2-year-old child, has received absolutely no justice! Casey Anthony, a mother who brags about what an incredibly liar she is, was allowed to walk away free by jurors who were more concerned about themselves than providing justice to Caylee. The Caylee Anthony trial has produced even worse results than the O.J. Simpson trial. O.J. Simpson's lawyers once said "If the glove don't fit, you must acquit." O.J. Simpson then placed his hand in the glove in a way that appeared as if the glove did not fit. But the way the Casey Anthony trial has taken place, it essentially means the jury should acquit even if the glove fits or not. The bottom line is that the Casey Anthony trial has produced the same disappointing results as the O.J. Simpson trial. We are forced to ask ourselves, "Then who did commit the murder?" Jurors on the Casey Anthony trial were very selfish. One juror was scheduled to go on vacation on an ocean cruise on July 7th. You needed to be there by July 6th in order to make the trip. This juror obviously wanted to get finished as quickly as possible in order to make the cruise, even at the expense of Caylee Anthony and the justice she was cheated out of. Please share your thoughts about the Casey Anthony trial and the lack of justice associated with Caylee Anthony -- a beautiful little 2-year-old girl who was murdered. Jack "Dr. Death" Kevorkian Passed Away -- Should Suicide Be Legalized? Dr. Jacob “Jack” Kevorkian passed away on June 3, 2011 at the age of 83. Dr. Kevorkian became infamous in the 1990’s because he helped over 130 people die via physician-assisted suicide. Dr. Kevorkian continuously said “Dying is not a crime.” In each of these suicides, it was the patient who committed the final action. Believe it or not, Dr. Kevorkian was actually known as “Dr. Death” long before he helped people commit suicide. Colleagues throughout California and Michigan had always observed Kevorkian was particularly interested in dying patients. Dr. Kevorkian was a graduate of the University of Michigan. This is probably why he had a desire to settle down in Michigan and ultimately end up with a career writing articles about euthanasia, which were published throughout the world. Dr. Kevorkian did not truly become famous until the 1990s when he invented a device known as the “death machine.” This medical tool gave consenting patients the opportunity to self-inject an anesthetic followed by a lethal dose of potassium chloride. Jack Kevorkian labeled this machine as the “Thanatron,” since it was named after Thanatos – the figure of death in Greek mythology. Dr. Kevorkian and his volunteer attorney, Geoffrey Fieger, became well known all over the world because they continuously stood up to government laws, particularly in Michigan. The state of Michigan passed a law in 1993 preventing him from practicing physician-assisted suicides. Geoffrey Fieger constantly attacked Governor John Engler while supporting Dr. Kevorkian. Eventually, Dr. Kevorkian lost his licenses to practice medicine in California and Michigan. Nevertheless, Dr. Kevorkian continued to help people “End their lives with dignity.” Dr. Kevorkian continuously pointed out that people should not be forced to suffer and live with pain, since they were inevitably going to die anyways. Consequently, Dr. Kevorkian was convicted of second-degree murder in April of 1999. After serving eight years of a 10-to-25 year prison sentence, Dr. Kevorkian was released on parole after promising he would not aid in any further suicides. From that point on, Dr. Kevorkian devoted his life to oil paintings and jazz music. Occasionally, Dr. Kevorkian would market his work to the public. I just have one controversial question: How can that woman “Guarantee” anything? She is not God, and she is not in a position to judge Jack Kevorkian. If you examine the life of Jack Kevorkian, you will be surprised what a loving and caring man he was. And when you learn what I’m about to tell you, I believe you may change your mind about whether or not you will see Jack Kevorkian when you get to Heaven! But the evidence suggests Jack Kevorkian didn’t read his Bible enough to learn it is a relatively violent book – describing various forms of judgment, fights, murders, and torture. If Jack did read his Bible from beginning to end, it’s disappointing that he didn’t become friends with the Lord along the way. You would tend to think that a man capable of understanding the concept that “Death is not a crime” would also be capable of understanding the concept that “Good days would not exist if it wasn’t for bad days.” In life, we often learn from bad experiences just as much as we learn from good experiences. But this still doesn’t necessarily mean Jack Kevorkian won’t be in Heaven. We don’t know what happened during the last days of Jack Kevorkian’s life. During his last days, Jack Kevorkian probably thought a lot about his life, his family, and his loved ones. We know he was raised as a Christian, and we know God was always on his mind. How do we know that Jack Kevorkian didn’t ask forgiveness of his sins and accept Jesus Christ as his Lord and Savior, just as many of his painfully sick patients did? There’s no question Dr. Kevorkian will be judged for his actions in life. But there’s also no doubt he would spend eternity with the Lord if he felt comfortable being with Him. How do you “Feel comfortable being with the Lord” you ask? Simple; cause the Lord to see you as He sees Himself. The way you do that is by covering yourself in the blood of Jesus Christ. You do that by asking forgiveness of your sins and accepted the work of Jesus on the cross. This is the whole reason why Jesus allow Himself to be tortured that way; He paid the price for everyone’s sins, even though His life perfectly agreed with the will of God. I want to end this article by telling the enemies of Dr. Kevorkian that they should not be proud or happy that Jack Kevorkian may be in hell right now. Jesus Christ loved Jack Kevorkian enough to die for him. Keep that in mind before you run your mouth. And also keep in mind that the Lord Jesus Christ doesn’t like hypocrites! Please feel free to share your thoughts on this. Do you believe suicide will be leglaized one day? How about the way hospitals take people off of life support all the time? Al-Qaida militant killed in US strike in Pakistan - Direct from AP - Barack Obama Gets the Job Done Again! DERA ISMAIL KHAN, Pakistan – A top al-Qaida commander and possible replacement for Osama bin Laden was killed in an American drone-fired missile strike close to the Afghan border, a fax from the militant group he heads and a Pakistani intelligence official said Saturday. Ilyas Kashmiri's apparent death is another blow to al-Qaida just over a month after bin Laden was killed by American commandos in a northwest Pakistani army town. Described by U.S. officials as al-Qaida's military operations chief in Pakistan, the 47-year-old Pakistani was one of five most-wanted militant leaders in the country, accused of a string of bloody attacks in South Asia, including the 2008 Mumbai massacre, as well as aiding plots in the West. Washington had offered a $5 million bounty for information leading to his location. His death was not confirmed publicly by the United States or Pakistani officials. Verifying who has been killed in the drone strikes is difficult. Initial reports have turned out to be wrong in the past, including one in September 2009 that said Kashmiri had been killed. 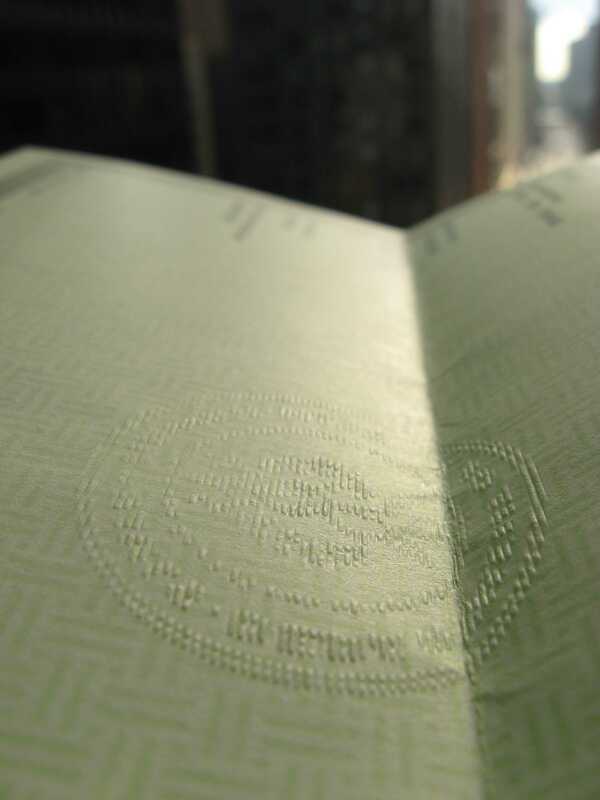 Sometimes they are never formally denied or confirmed by authorities here or in the United States. But a fax from the militant group he was heading — Harakat-ul-Jihad al-Islami's feared "313 Brigade" — confirmed Kashmiri was "martyred" in the strike at 11:15 p.m. Friday in South Waziristan tribal region. It was sent to journalists in Peshawar. "God willing, America, which is the 'pharaoh' of this, will soon see a revenge attack, and our real target is America," it said. The statement was handwritten written on a white page bearing name of the group, which has not previously communicated with the media. The Pakistani official also said Kashmiri was among nine militants killed in the strike. He spoke on condition of anonymity in line with his agency's policy. On Friday night, officials said several missiles hit a compound. The official Saturday said the men were meeting in an apple orchard near the house when the missiles hit. Kashmiri's name was on a list of militants that the United States and Pakistan recently agreed to jointly target, officials have said. The successful strike could help repair ties between the two countries that were badly damaged by the unilateral American raid, especially if Islamabad helped provide intelligence leading up to the attack. Said to be blind in one eye and missing a finger, Kashmiri was one of the country's most accomplished — and vicious — militants. He fought with jihadi fighters in Afghanistan and in Indian-held Kashmir in the 1990s and was so close to al-Qaida's central command that he had been mentioned as a contender for replacing bin Laden, though many analysts thought the fact that he was not an Arab meant he was unlikely to get the post. Indian officials have alleged he was involved in the 2008 Mumbai siege that killed more than 160 people. He has also been named a defendant in an American court over a planned attack on a Danish newspaper that published cartoons depicting the Prophet Muhammad in 2005. In an ongoing terror trial in Chicago, testimony from an American-Pakistani militant has alleged that Kashmiri helped plan the Mumbai siege and wanted to attack U.S. defense contractor Lockheed Martin. Kashmiri had been angry over U.S. drone attacks inside Pakistan and wanted to target the company, David Coleman Headley testified. Kashmiri has most recently been linked to last month's 18-hour assault on a naval base in Karachi. He is also accused of masterminding several bloody raids on Pakistan police and intelligence buildings in 2009 and 2010, as well as a failed assassination attempt against then-President Pervez Musharraf in 2003. The U.S Department of State says he organized a 2006 suicide bombing against the U.S. consulate in Karachi that killed four people, including an American diplomat. American drones began firing missiles at al-Qaida and Taliban targets along the border in 2005, but the attacks picked up pace in 2008 and have risen in frequency ever since. Pakistani army officers and politicians publicly protest them, too weak to admit to working with the ever unpopular America in targeting fellow Pakistanis, but the country's intelligence agencies have been known to occasionally provide targeting information. Opposition to the strikes grew this year after a CIA contractor shot and killed two Pakistanis in the street, triggering ever more intense anti-American anger. After the bin Laden raid, which was seen by many here as an outrageous violation of the country's sovereignty, the parliament issued a declaration calling for the attacks to end. Pakistani leaders were not immediately available for comment on Friday's attack. Kashmiri was accused of killing many Pakistanis, including police and army officers, so their public reaction may be muted. The United States does not acknowledge the CIA-run program, though its officials have confirmed the death of high-value targets before, including the head of the Pakistani Taliban, Baitullah Mehsud, in 2009 — a strike welcomed by many Pakistan officials because he too was a sworn enemy of the country. Washington says the strikes are accurately killing militants and are disrupting plots against the West as well as planned attacks on U.S. troops in Afghanistan. V - Should ABC Film a V Miniseries to Give V the Ending it Deserves? Recently, I wrote an article titled “ABC Cancels V – But Were Controversial Political Reasons Involved.” One of the Followers of my blog replied by saying ABC should create a miniseries allowing the plot of V to end in a satisfying way. I thought this was an excellent idea, to such an extent that I am now considering contacting ABC this week to speak on behalf of other V fans. I believe it may be fitting for V to conclude as a miniseries, since it started as a miniseries in 1983. ABC has absolutely no excuse for not allowing a miniseries of V to be filmed. If you take the time to read the detailed response I wrote below, you will learn that we should probably boycott ABC programs if ABC is not willing to allow a V miniseries to be filmed. ABC owes it to viewers, both morally and financially, to film a V miniseries allowing the series to end in a satisfying way. The V series currently has unanswered questions that a miniseries is capable of providing answers for. Please read the following article I wrote as a response to a great comment on my blog. You will learn why ABC has no excuse for not filming a miniseries of V. Let me know if you believe I should contact ABC about this matter. Your idea of an ABC miniseries used to conclude the V series is excellent! As you said, a V miniseries would allow remaining questions in the storyline to be answered in ways that would make fans of the V series happy. A miniseries would be seen on TV, generate advertising revenue for ABC, and it would also allow sales on Blu-ray/DVD to occur. As the V plot currently exists, fans have absolutely no reason to buy V on DVD or Blu-ray, because that would be like buying a book missing the last few chapters. V is a series that deserved to be aired for a dedicated final season, simply to make fans happy and fill in remaining gaps in the storyline. Fans like us spent a lot of time watching V -- helping ABC generate advertising revenue during each commercial we sat through. I believe ABC owes it to us, both morally and financially, to create a miniseries of V dedicated to concluding the series in the proper way. Perhaps a miniseries is in fact the fate the new V series was meant to receive all along. After all, a miniseries is how V started out in 1983. Perhaps a miniseries is the way V should go out in 2011. Do you think we should approach ABC with this idea of a short miniseries for V? It certainly is within their budget! Look at all the movies Steven Seagal films, produces, and puts directly on DVD. ABC certainly has the resources to film a V miniseries put directly on DVD. The cast would be paid relatively well, the product would be sold at a reasonable price, and fans would be happy because the plot answers their questions and gives a proper conclusion to a great TV series. If ABC is not willing to film a miniseries of V for fans of the series, it literally means ABC does not care about viewers of ABC programs! As of right now, ABC only cares about themselves and the money they can make from viewers. ABC may claim they care for viewers, but what they really mean is that they only care for viewers helping them make money. With that in mind, should we be watching ABC programs? Perhaps we should boycott ABC programs if ABC executives are not willing to give V the conclusion it deserves in a miniseries. Even if the miniseries was a low-budget project placed directly on DVD, at least fans of the series would be happy. In the 21st century we live in today, ABC can’t even use logistics expenses as an excuse for not producing a V miniseries. Rather than putting V directly on DVD and shipping the product to stores or allowing it to be sold online, ABC could sell the V miniseries online in an on-demand format. Netflix, Comcast, or Xbox Live would all be capable of allowing viewers to watch a V miniseries in an on-demand format. The bottom line is that ABC has no excuse for not allowing a V miniseries to be filmed in order to calm down the V fans that ABC hyped up! Do you think I should contact ABC this week to talk about a V miniseries? Republican governor Arnold Schwarzenegger easily became governor of California, a state filled with a majority of voters labeling themselves as Democrats. The reason Schwarzenegger was able to become governor is because the people of California trusted him. Arnold had apparently been successfully married for a long time while simultaneously maintaining a successful career in acting. But we now know Schwarzenegger’s marriage, career, and understanding of the word “responsibility” involve a lot of controversy. Up to this point, we thought Arnold Schwarzenegger was the father of four children, currently ranging in age from 14 to 21 years old. But we now know that Schwarzenegger is the father of a fifth child that is 10 years old. The mother of this child is a member of the staff employed at Schwarzenegger’s home known as the Brentwood mansion. This means that when Schwarzenegger had young children ranging in age from 4 to 11 years old, he was cheating on his loyal wife, Maria Shriver. The fact that Arnold Schwarzenegger refers to this adulterous personal incident as an “event” proves he is only looking at the situation from a selfish political point of view. Arnold makes it clear that the timing of this revelation to his family was dependent on the announcement being made after he left the governor’s office! This is further confirmation that Schwarzenegger is a very selfish man, looking at things only from a political point of view. Arnold Schwarzenegger claims that he takes “full responsibility” for the hurt he has caused. Some of this actually seems true, since we know Arnold has financially provided for his fifth child. This was a very responsible action, showing that Schwarzenegger is a far more responsible man than many others. But there is a big difference between responsibility and accountability. By using the word “responsibility” in place of the word “accountability,” Arnold Schwarzenegger is able to avoid negative publicity and put a positive spin on much of what he has done over the last ten years. For the last ten years, eight of which were governor of California, Arnold Schwarzenegger has not been willing to accept any form of accountability for his actions. From the moment Schwarzenegger was running for governor, he was keeping this awful situation a secret from his family and the media. Schwarzenegger knew that he would not be able to achieve his political goals if this information was revealed to the public, since the California voters would hold him accountable for his actions. As a result, Schwarzenegger’s lovely wife and children now suffer. I’m particularly disappointed by the way Schwarzenegger’s statement concludes by saying “I deserve your attention and criticism.” This suggests Arnold wants the spotlight back on himself, as he once again becomes a Hollywood actor. We know that Arnold Schwarzenegger’s true lies have terminated his 25-year marriage. But it now seems Arnold Schwarzenegger doesn’t mind being seen as a running man, trying to put on the image of a predator seeking employment as a commando. What are your thoughts about this situation? Do you believe the way Schwarzenegger kept this situation secret from California voters was a raw deal? In my opinion, Arnold was acting like a selfish barbarian. ABC Cancels V – But Were Controversial Political Reasons Involved? As a kid growing up in the 1980’s, one of my favorite TV shows was V. The program called V started out as a 1983 sci-fi miniseries based on aliens known as Visitors that were invading Earth. This miniseries expanded to a one-hour TV show airing weekly from 1984 through 1985. Over the years, the V reruns helped gather a very loyal group of followers. This motivated ABC to start a new V series, which first aired in 2009. When ABC first announced this new series, fans of the original series (including me) were very happy! Unfortunately, the new HD version of V has been cancelled by ABC after just two seasons. Personally, I think this is very disappointing and may involve controversial motives associated with politics. The audience of V was growing and ABC has left a lot of cliffhanger questions in the plot unanswered. ABC claims that low ratings are the reason why V will not be renewed for a third season. I question if this is the true motive, though. No Ordinary Family and Detroit 1-8-7 also air on Tuesday nights, but V has higher ratings than those two programs which were also cancelled on this Friday the 13th. Although Detroit 1-8-7 started out with impressive ratings, the ratings dropped significantly. But the year-to-year ratings of V clearly showed that the V program had ratings that were increasing as the audience became larger. One of the really cool things that the new V series did during the second season was bring back Jane Badler to play the role of Diane – the same role she played in 1983. In the new V series, Diane played the mother of the character known as Anna – the Visitor High Commander. Diane had once been Queen but was imprisoned for 15 years because she proposed living in peace with the humans. Although Diane apparently died in the last episode of the second season, you would tend to think that if she survived 15 years and two different shows it would mean the writers could have found a way to bring her back again in the third season. Sadly, we will never know thanks to ABC. One controversial element that has me wondering if there were underhanded motives for V being cancelled by executives at ABC is the recent death of Osama Bin Laden. Many politicians have always said they noticed parallels between the premise of the show and the Obama administration. I believe words such as “hope” and “change” are simply common words in the world of politics. And the reason why the Visitors were concerned with offering healthcare to all humans (interpreted as President Obama’s “Universal Healthcare” by Republicans watching the program) is because humans need that type of healthcare system! If this parallels what President Obama is trying to do, it proves that President Obama is aiming high while shooting for the stars and achieving impressive results that are out of this world! This statement proves that many people believe the script of V was mixed with real-world politics in a controversial way. With that in mind, we need to ask ourselves if President Obama’s recent triumphs over Osama Bin Laden and Pakistan have anything to do with the cancellation of V – a series with a growing market of viewers. All of the cast and crew of V have repeatedly denied charges of political bias associated with real-world politics. Morena Baccarin is the actress that plays Anna – the leader of the alien Visitors. Baccarin says that she is very surprised by all the controversy, acknowledging that she did model her character after politicians but nobody in particular. This is what makes me wonder if somebody at ABC was motivated to cancel V for political reasons. Think about this for a moment. If the writers at ABC really were writing scripts based on what was happening with the Obama administration, it would mean the third season of V would be filled with praise and respect for the excellent accomplishments of President Barack Obama. If there were Republican executives at ABC, this would generate a motive for the cancellation of V. Either way, I am very disappointed that ABC cancelled V without giving it the ending it deserved. I just want to remind the political-minded executives at ABC of one thing. Although the V series may have been cancelled, even though the plot left a lot of questions unanswered and a lot of promises unfulfilled, the same cannot be said of the Obama administration. President Obama has fulfilled the promises he made while running for President of the United States of America! President Obama has restored the stock market, bailed the entire auto industry out of bankruptcy, passed a universal healthcare coverage plan, won the Nobel Peace Prize honor, and invaded Pakistan without permission in order to kill the most wanted criminal in the world, Osama Bin Laden. If there would have been a third season of V, it would have involved some form of new leader being introduced that had all the abilities of Captain America, Superman, and Professor X all rolled into one! ABC executives knew this, which may be why they cancelled V. But that won’t stop me from voting for Barack Obama! Please share your thoughts on this subject, especially if you are angry at the way ABC failed to give V the ending it deserved. Should We Keep Giving Pakistan Money? - Does America Help Fund Terrorism? Last night I was watching CNN and I saw a detailed report on what children in Pakistan are taught in schools. The report I saw was very devastating for a variety of controversial reasons. Once you learn each of the things I’m going to talk about, we need to ask ourselves another question: Why does the United States of American continue to literally “give” money to Pakistan to “help” their nation. Perhaps if the United States of America were to stop supporting Pakistan financially, the politicians of Pakistan would be motivated to stop false teachings that motivate hatred against Americans. First, children in Pakistan attend elementary schools where only boys are allowed to attend and learn. Young girls are forced to stay at home or attend a different school while covering themselves up. This immediately proves the bias involved in Pakistani schools. If the Pakistani men do not have the ability to control their lustful hormones, it is obviously not fair to cause female children to receive an inferior education. Second, the Pakistani teacher taught all of the young boys that it was Americans that are responsible for the terrorist bombings in places like Pakistan, Afghanistan, and Iraq. This teacher went on to tell the children that Americans enjoy watching the Arabs suffer. The children then told the interviewer that the TV shows they watch say that Americans try to blame Osama Bin Laden for all of these terrorist attacks in order to try and get Pakistan and the Taliban to fight each other. What is even worse is that these kids said they didn’t believe the lies from the Americans, saying that they look to Osama Bin Laden as their hero – someone that motivates them to fight against the Americans with hatred. Third, I was absolutely stunned when I saw what sort of cartoons the Pakistani children watch. In one of the scenes shown on TV, there are American vehicles traveling along a road below a large cliff. An Arab citizen has bombs strapped to his chest and decides it is best to kill the Americans, even if he has to kill himself to do it! In other words, the children of nations such as Pakistan, Afghanistan, and Iraq are taught from a young age that it is a good thing to die a martyr if it means killing Americans walking on their self-proclaimed holy land. Fourth, children attending schools like this obviously have parents that approve of their children receiving that type of education in that type of culture. This is the fundamental reason why it is obvious that Osama Bin Laden had support in the Pakistani government. There is no way in the world that the Pakistani government was not aware of the fact that Osama Bin Laden was living in that huge building with large walls filled with barbed wire! This is the reason why President Barack Obama made the intelligent decision not to notify the Pakistani government that our counterterrorist military unit was on the way. Fifth, if President Obama would have notified the Pakistani government that our counterterrorist military unit was on the way, the Pakistani government would have given Osama Bin Laden an early warning and told him to leave. Actions speak louder than words; if President Obama believed otherwise, he would have contacted the Pakistani government to let them know what was going on. In fact, in an interview on 60 Minutes, President Obama said he believes the Pakistani government did have connections with Osama Bin Laden. This makes sense, since the Pakistani government allows young males to be taught lies that inspire them to hate the United States of America and look to Osama Bin Laden as a hero. Sixth, according to the Congressional Research Service, Pakistan has received over $20 billion from the United States since 2002! This literally means that Pakistani children wouldn’t be receiving the education they are today if it wasn’t for the funding provided by the United States of America. This also means that the United States of America helped fund a Pakistani government the whole time period that Osama Bin Laden lived in that country. This makes you wonder why the United States of America continues to help Pakistan at all. The Arabs in Pakistan have made it clear they don’t want any American citizens walking on their land, not even military soldiers going in to get Osama Bin Laden. However, it isn’t surprising to see that the self-proclaimed “holy” Pakistani Arabs are willing to accept billions of dollars from the supposedly “unholy” American citizens living in the United States of America. But let’s examine why the United States may be motivated to continue offering money to Pakistan. Security is one of the main reasons why the United States probably helps fund Pakistan. Even though Pakistan does a terrible job with terrorists, we need to realize that Pakistan is a nuclear nation. CNN said that Pakistan has approximately 100 nuclear warheads that are kept in secret locations. Why do I have a feeling that if the United States of America didn’t offer billions of dollars to Pakistan, those nuclear warheads would find their way into the hands of terrorists such as Osama Bin Laden and dictators such as Saddam Hussein? Stupidity is another one of the main reasons why Pakistan needs financial help from the United States of America. Pakistan had the world’s most wanted criminal living close to a military installation for a very long time, which means the Pakistani government was supporting him or the Pakistani government is incredibly stupid. The Pakistani government claims they were not supporting Osama Bin Ladan, essentially admitting to their own stupidity and irresponsibility. With that in mind, it seems reasonable that very poisonous radioactive materials such as Uranium and Plutonium could be mishandled or misplaced – given to terrorists – at nuclear power locations if it wasn’t for help and/or funding from the United States of America. Honesty is another one of the main reasons why the United States probably helps fund Pakistan. Believe it or not, there probably are quite a few Pakistani government officials that want to work with the United States of America and put an end to terrorism. Pakistani teachers telling kids lies about America always seem to forget to tell the kids they teach that Osama Bin Laden had officially declared war on the nation of Pakistan. This small hope is like a seed that the United States is trying to help grow, which is why we help fund it and try to gain as much information as possible along the way. In conclusion, I would just like to say that whatever President Barack Obama and his staff decide to do is something I will trust as a citizen of the United States of America. From the moment he decided to run for president, Barack Obama has made it clear that he was going to be strict with Pakistan. President Obama has lived up to this promise, which is why we can now say the coward terrorist Osama Bin Laden has been killed. I feel like I can trust a man like Barack Obama who proactively brings unity to our country in a way that we haven’t seen since 9/11/2001 when we achieved unity as a reaction to terrorist attacks. Please share your thoughts by writing a comment. 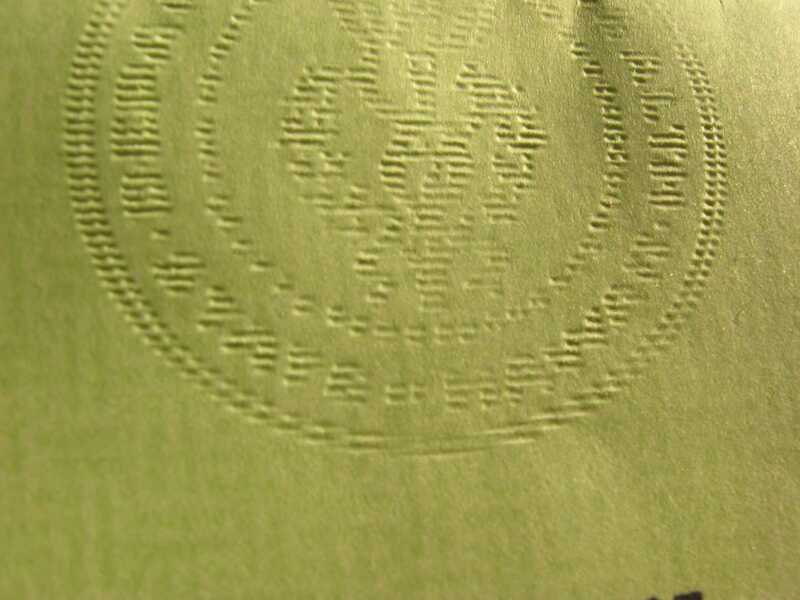 I am unemployed and I have a problem with epilepsy, which makes employment difficult. Please consider making a Tip donation. If you enjoyed this article, please Follow me. Osama Bin Laden is DEAD! - President Barack Obama Reunites America - Justice Has Been Done! President Barack Obama has just addressed the nation, confirming that Osama Bin Laden is dead! Justice has been done! Not since September 11, 2001 has America been united in the way that we are united as a country right now. May 1, 2011 will forever be remembered as the day President Barack Obama reunited America with a triumphant victory over terrorism. This announcement will probably go down in history as the most remembered speech President Obama ever makes. Just as everyone remembers where they were when the Twin Towers fell on September 11, 2001, everyone will remember where they were when they heard President Barack Obama officially confirm that Osama Bin Laden is dead! Osama Bin Laden has been the face of terrorism for the last decade. President Obama has gone to very great lengths to work with foreign nations such as Pakistan to make sure that Osama Bin Laden was hunted down. Reasons like that are why President Barack Obama won the Nobel Peace Price honor. All of these excellent efforts of President Obama have paid off! The United States has conducted a military counterterrorist operation that has killed Osama Bin Laden! President Obama authorized this military operation last week after he learned where Osama Bin Laden was hiding in Abbottabad, Pakistan – about 80 miles north of Islamabad. This has been officially confirmed by President Barack Obama. President Obama also made it clear that no Americans were harmed in this counterterrorism operation that killed Osama Bin Laden. When he took office, President Obama made it 100% clear that his #1 military priority as leader of America was to kill Osama Bin Laden. President Obama has achieved this goal because of his strong desire to do so – doing everything possible to obtain justice for the thousands of innocent people killed by Bin Laden’s Al-Qaida organization all over the world. President Obama also made it 100% clear that the United States of America is not at war with Islam, because Osama Bin Laden was never recognized as an Islamic leader. President Obama explained that Osama Bin Ladan was a murderer of Islamic people, too. It didn’t matter to Osama Bin Laden if you were a Christian, a Muslim, or a Jewish person; the ruthless terrorist attacks of Osama Bin Laden always resulted in murder! Innocent people were always the victims of the coward named Osama Bin Laden. Older people have already stated that not since Adolf Hitler has America hated an individual as much as Osama Bin Laden. The death of Osama Bin Laden has motivated family and friends to call each other in the middle of the night to tell them the good news! All over the United States of America people are gathering and celebrating! The United States government currently has possession of the body of Osama Bin Laden. It has been fully confirmed that this body is Osama Bin Laden. The CIA and President Obama deserve a lot of credit for making this happen. Over the years the Pakistani government has claimed that Osama Bin Laden was not in Pakistan. Government officials of Pakistan often tried saying that Bin Laden was hiding in Afghanistan. Over the last several months, our relations with Pakistan have been very strained. But it was President Obama’s ability to negotiate with the Pakistani government that helped make this operation possible. Normally, the Pakistani government says they don’t want American men on their soil. But President Obama did everything possible to make sure America was able to enter Pakistan and perfectly execute this military counterterrorism operation that killed Osama Bin Laden. President Obama was personally involved in five security meetings regarding this matter, which took months to gather the information and carry out the military operation. I want to thank President Obama for being involved in such a personal way. It was President Obama’s strong desire to eliminate Osama Bin Laden that made this military operation possible. Millions of people across the country shouted words of encouragement to President Barack Obama as he delivered this speech to the world. One of the most memorable moments of the 21st century will be President Barack Obama—winner of the Nobel Peace Prize honor—officially announcing that he authorized the counterterrorism operation that killed the most hated man in the world! The “War Against Terror” is now officially over! Osama Bin Laden is a man that cannot be replaced. Young men from across the world would come to the Middle East just to be a part of Al-Qaida because of a sadistic form of respect they had for “the face of terror.” Osama Bin Laden cannot be replaced, which means the war against terrorism has changed forever. President Barack Obama will forever be remembered as the man who ended the war on terrorism. On May 1, 2011 America became united once again. We are united in a way that we have not seen since September 11, 2001. America is united under the leadership of Barack Obama. Justice has been done! I am very pleased to report that President Barack Obama has trumped Mr. Donald Trump. For the last several weeks we saw Donald Trump form a political following making false claims about Barack Obama. Everything from whether or not Barack Obama was really born in America to whether he possessed the status of a "natural-born citizen" was brought into question. All of this was caused by the loud mouth and selfish attitude of Donald Trump. Of course, it did help that millions of people were dumb enough to believe what Trump was saying without investigating the facts. Normally, a hospital will not allow a birth certificate to be shown to the public. But President Obama asked the hospital he was born at in Hawaii to make an exception this time. The hospital did as President Obama asked and officially put an end to whether or not President Obama was born in America. 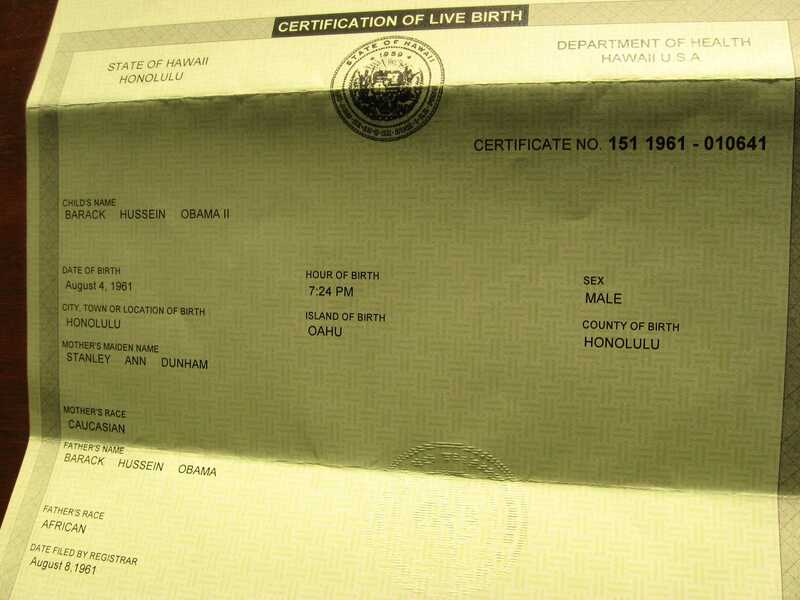 Now that President Obama has "shown us his birth certificate" there is absolutely no doubt Barack Obama Jr. was born in America and is a natural-born citizen of the United States of America. I also want to make something clear about the term "natural-born" citizen. Nowhere in the U.S. Constitution is the term "natural-born citizen" defined. And nowhere in our current law is there a requirement that a person be born on American soil and possess two parents that were both American citizens. The way "birthers" claim people are required to have two American parents in order to be classified as a "natural-born" citizen is nonsense based on a document that related specifically to John McCain. This document talked about the life of John McCain and his American parents (plural) and made a specific reference to him as a "natural-born" citizen. But this document was talking about John McCain and only John McCain! This document was never labeled as a definition of what a "natural-born" citizen is! Barack Obama even helped write that document for John McCain! Again, I want to make it 100% clear that in no part of the universally accepted law applying to all Americans (plural) is the term "natural-born citizen" defined in any way capable of preventing Barack Obama from being President of the United States of America. If that were the case, a lot of American citizens would lose eligibility to run for president. Those same people would lose the right to call themselves "natural-born" citizens, even though they were born on American soil as a child to an American parent. I'm pointing this out because Donald Trump doesn't know when to fold. This is why millionaire Donald Trump has gone bankrupt in the past while running businesses worth billions of dollars. In a book about Donald Trump, it has been reliably reported that Donald Trump is worth approximately $150 Million right now. But when this was reported we saw that Donald Trump took the author of that book to court because he claimed that this report damaged the "brand" of the name Trump. Donald Trump "claims" to be a billionaire, but his tax records would obviously reveal that he is not anything close to being a billionaire. Thus, the revelation of tax records would show that Donald Trump is a liar. Previously, Donald Trump had said that the only way he would be willing to reveal his personal tax information is if President Obama is willing to reveal his birth certificate. This means the ball is now in the court of Donald Trump. Will Donald Trump do as he promised? Or will Donald Trump once again make a fool of himself when America is reminded that his foot is just as big as his mouth -- proven by the fact that every once in a while Donald Trump manages to put that foot in his big mouth. Fold Donald...You were trumped last week by me, Michael Zoran. And this week you have been trumped by President Barack Obama! For more than a week, Sony’s PSN online network that works with the PS3 game console has been down because it was hacked into by pirates. Yet Sony’s management has refused to even admit that it was hackers that caused the problem. Connecticut Senator, Richard Blumenthal, carefully listened to the situation regarding millions of people that have been influenced in a negative way by Sony’s poor management. Thankfully, Senator Blumenthal recently took the time to responsibly act on behalf of millions of people across the country. Senator Blumenthal took the time to write to the president of Sony Computer Entertainment of America, Jack Tretton. In this message to Tretton, Senator Blumenthal criticizes Sony’s lack of effort to inform users of the PSN service that their personal financial information has been compromised. Problems such as identity theft, illegal purchases, and many other troubles with credit cards and debit cards can easily occur in this type of situation when people are not informed within a reasonable time period. Yet Sony’s management seems unwilling to accept accountability for all of these problems due to the fact that it would generate even more negative publicity for the PS3 – a console that has been criticized for disappointing sales ever since it launched in 2006. You can read the entire letter that the very responsible Senator Richard Blumenthal writes to SCEA president Jack Tretton, here. Recently, Donald Trump has been criticizing President Barack Obama in very personal ways. In particular, Mr. Trump has selfishly questioned whether our president is actually a citizen of the United States and whether our president is actually a Christian or a Muslim. Mr. Trump went so far as to arrogantly ask President Obama to personally show him his birth certificate. Donald Trump has foolishly claimed that President Obama “Almost certainly will go down in history as the worst president ever.” Fortunately, President Obama has responsibly proven that he is not going to waste valuable time replying to foolish comments made by an arrogant millionaire like Donald Trump any more than he would waste time replying to anyone else making a foolish statement. In all likelihood, President Barack Obama will be remembered for the fact that he is the first African American President of the United States and the fact that he is one of only four American presidents to ever win the Nobel Peace Prize honor. Unfortunately, in the controversial world we live in, this still leaves some people wondering if there is any merit to the subjects Donald Trump mentioned regarding the birth certificate of President Obama and his birth origin. Thankfully, anyone that invests even the smallest amount of time researching this subject can easily find the answer. 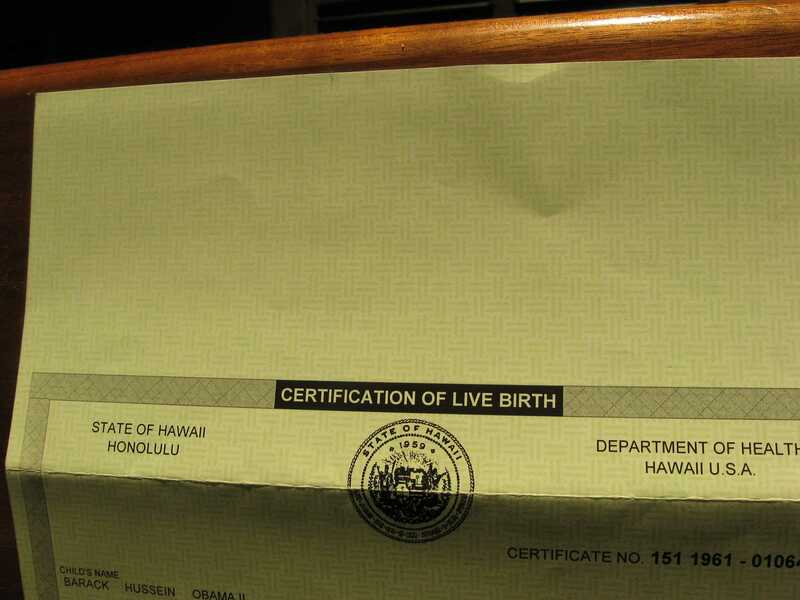 There is no doubt that the original birth certificate with a raised seal and an official signature stamp exists at Hawaii’s State Health Department. 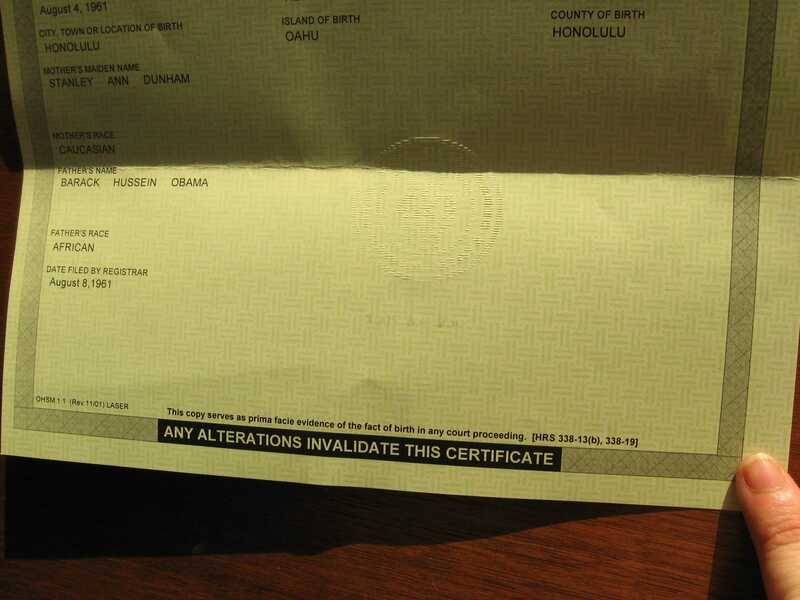 This birth certificate document confirms that Barack Obama meets all of the requirements from the State Department for proving U.S. citizenship. I want to confirm this fact and reinforce this subject. Barack Obama was born on August 4, 1961, at Kapi'olani Maternity & Gynecological Hospital (now called Kapi'olani Medical Center for Women & Children) in Honolulu, Hawaii. Barack Obama’s original birth certificate is also on file at this hospital. In addition, several local newspapers in Hawaii have documented his birth at that time with public announcements of birth. This means that in August of 1961, local newspapers in Hawaii showed Barack Obama listed as a Newborn Baby. “State officials say there’s no doubt Barack Obama was born in Hawaii. 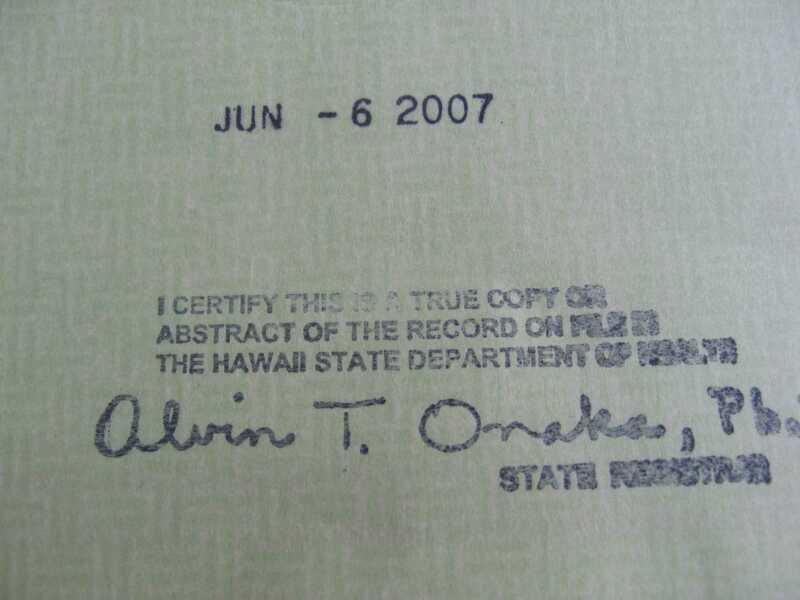 Health Department Director Dr. Chyome Fukino said Friday she and the registrar of statistics, Alvin Onaka, have personally verified that the health department holds Obama’s original birth certificate.” Dr. Fukino went on to say that no state official, including republican Gov. Linda Lingle, ever instructed that Obama’s birth certificate be handled differently. 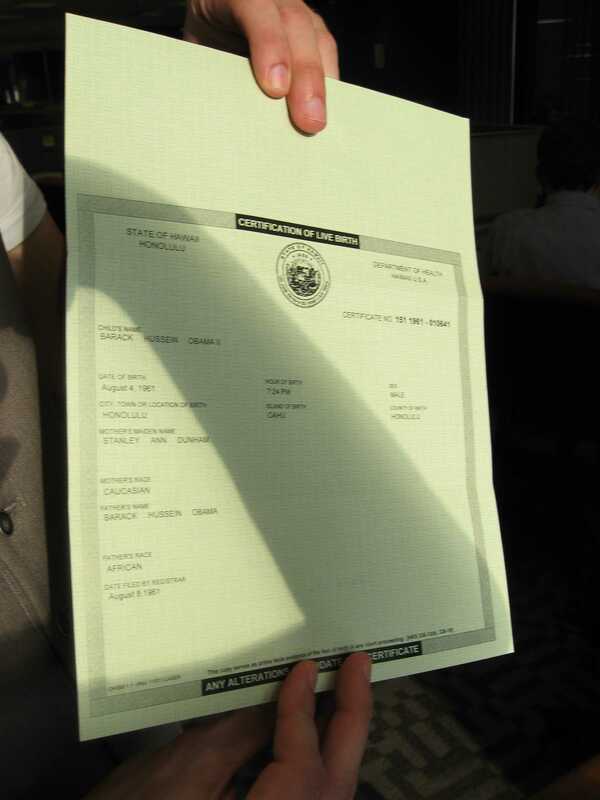 State law bars the release of a certified birth certificate to anyone who does not have a tangible interest. Obviously, Donald Trump does not have a tangible interest in the life of Barack Obama. This is the reason why President Obama has not taken time away from focusing on important areas of war, gasoline prices, taxes, and national debt in order to concentrate on childlike nonsense with a man like Donald Trump – a man that enjoys portraying himself as a bully but always runs away when confronted by even the weakest people. For example, Donald Trump loved aggressively bragging that he was rated ahead of President Obama in a hypothetical political poll conducted last week. But after that subject drew a lot of publicity, it obviously affected the results conducted the next week. This week’s poll showed President Obama with 49% of support from voters, while Donald Trump had only 34%. When Megan Alexander of Inside Edition asked Donald Trump about his declining support from poll voters, he incorrectly told her that the results of that poll were from a long time ago. When Megan tried to tell Mr. Trump that the poll was just released, he quickly pulled his microphone off and said he needed to leave. This is the clear act of a self-proclaimed bully running away when someone stands up to him. Donald Trump continues to say “Why doesn’t Barack Obama give his birth certificate?” The answer to that question is because President Obama doesn’t need to! Doctors, registrars, and newspapers have already confirmed the birth of Barack Obama in Hawaii! 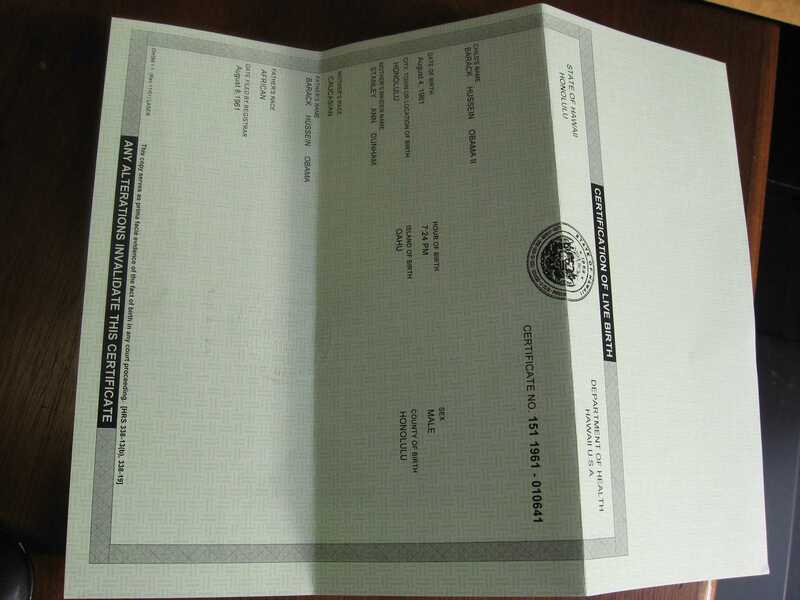 Any critic that invests a small amount of time can visit websites such as FactCheck.org and PolitiFact.com to see high-resolution 3D scanned images of the original version of President Obama’s birth certificate. 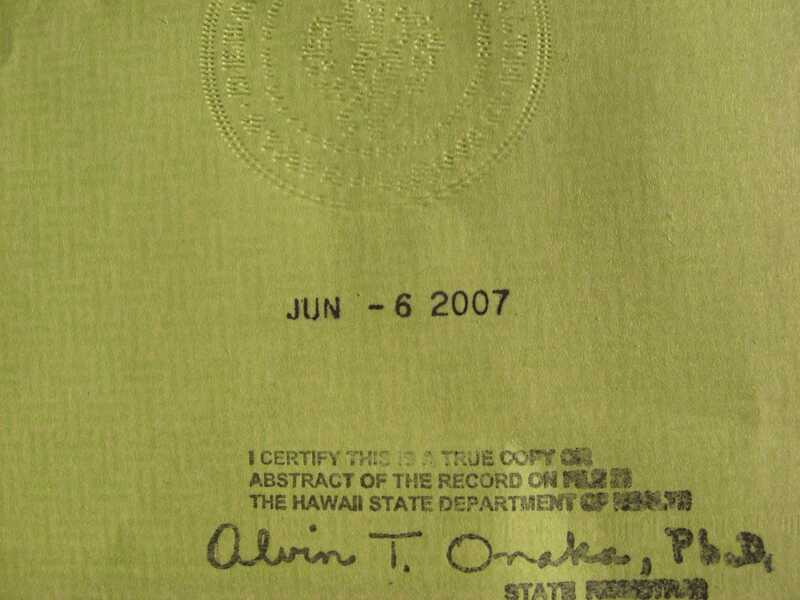 This proves the birth certificate has a raised seal and it confirms Barack Obama is a citizen of the United States. Now that I have proven it would have been effortless for Donald Trump and his staff of employees to obtain the answers he was asking about President Obama’s birth certificate, it raises a very important issue that needs to be answered. Did Donald Trump really care about President Obama’s birth certificate and his status as an American citizen? Or did Donald Trump have some other motive, such as politics, for continuously talking about this subject? Donald Trump’s inability to find the answer to his question about the birth certificate of Barack Obama has confirmed two very important issues. First, we have learned that Donald Trump lacks the enthusiasm and intelligence needed to be Present of the United Sates of America. Donald Trump’s actions, or lack thereof, reveal he is incredibly lazy and/or incredibly stupid – to the point that he doesn’t even know how to personally use the Internet or read official statements confirming Barack Obama is an American citizen. Second, we have learned that Donald Trump lacks human resource management skills, since the staff currently working for him is incredibly lazy and/or incredibly stupid – to the point that the staff of employees representing him doesn’t even know how to use the Internet or basic search engines. If Donald Trump, his children, or the delegated employees that represent his management skills would have taken just five minutes to enter several keywords into an Internet search engine like Google, they would have easily found all the answers to their questions from official sources representing the state of Hawaii! 1. Donald Trump is a man that lacks management skill. The employees Donald Trump feels confident enough to delegate responsibility to do not possess the level of skill needed to answer the easily-answered questions he publicly asks. If Donald Trump’s staff of employees lacks the skill needed to find and analyze the answers to easily-answered questions, such as President Obama’s birth certificate, it is logical to conclude Donald Trump does not possess the skill or human resources needed to solve complex problems as President of the United States. 2. Donald Trump’s primary motive for continuously asking to see the birth certificate of Barack Obama is inspired by one word: Greed. Each time Donald Trump immorally questions the citizenship status of Barack Obama, Trump believes it helps his political career. Donald Trump currently has a desire to be the 2012 republican nominee for president. But even if Donald Trump decides to change his mind, he still places financial value on all the promotional publicity the media is currently giving to him. Donald Trump sees this publicity as a free form of marketing promotion, even though it actually comes at the expense of another man – Barack Obama. Once again, I’d like to reinforce that these two logical conclusions confirm Donald Trump lacks the qualifications and skills needed to be President of the United States. It is logical to conclude that even if Donald Trump was elected as President of the United States, he would lack the skills needed to hire a qualified staff capable of responsibly assisting him in ways that would provide answers to questions he considers crucial. I’d also like to discuss something very disheartening and very discouraging. Donald Trump’s recent public comments reveal that he analyzes information based on selfish points of view. These selfish points of view allow Donald Trump’s mind to perceive himself as a superior individual. In addition, when Donald Trump is presented with facts he doesn’t want to believe, he aggressively accuses the person presenting the evidence as a conspirator against him! For example, the New York Post specifically said "$ize Matters," because Donald Trump claimed that he's much more wealthy than potential GOP rival Mitt Romney. "My net worth is many, many, many times Mitt Romney," Trump said on CNN. Obviously, this exaggeration-filled statement reveals that Donald Trump lacks the management negotiation skills needed to be President of the United States. However, during an interview on Good Morning American, host George Stephanopoulos questioned whether the American public would believe Donald Trump did a good job with finances after those financial records and taxes were released. Donald Trump foolishly responded by claiming that he may not be willing to release these financial records unless Barack Obama is willing to release his birth certificate to the public! This certainly proves Donald Trump does not have the ability to handle tough questions under fire – confirming the logical analysis that Donald Trump does not possess the negotiation skills needed to be President of the United States. But this was not the only absurd statement Donald Trump made in this interview with George Stephanopoulos. Donald Trump’s other statements confirmed the logical analysis that Donald Trump lacks the management skills needed to be President of the United States. This is especially true in the area of human resource management, as we saw when George Stephanopoulus questioned Donald’s Trump about the lack of evidence his private investigators have found regarding President Obama’s birth certificate. During this interview, Donald Trump questioned whether Barack Obama is an American citizen. Stephanopoulus immediately stood up to Trump by saying “There is no question” regarding the status of Barack Obama as a natural-born citizen of the United States. Trump relied by saying “I know exactly what you’re getting at,” but Stephanopoulus fired back by assertively saying “The Facts!” At this point Stephanopoulus started citing official sources that provided those facts – facts that Donald Trump obviously was not interested in learning about. If Donald Trump was an unselfish American with a true “Hope” to learn Barack Obama is an American citizen, Trump obviously would have listened to the mountain of fact-based evidence presented by George Stephanopoulus. Instead, Donald Trump made the ludicrous statement saying, “George, they’ve co-opted you.” When Stephanopoulus asked “Who’s they?” Trump replied by saying “Well, obviously, Obama and his minions.” This statement clearly shows that Donald Trump is not willing to believe facts that he does not want to believe. George Stephanopoulus calmly asked “Have they found anything?” Trump replied by saying “We are going to see what happens.” Stephanopoulus asked “What have they found?” Like a broken record, Trump replied “We are going to see what happens.” Stephanopoulus asked “When?” At this point a shaken Donald Trump continuously answered “We are going to see what happens,” and then like a bully that had been called out on a bluff insisted that George move on to the next question. All of the statements of Donald Trump focus exclusively on the good things that he has done in his life. But Donald Trump apparently doesn’t realize that in order to make it into the White House you need to be able to withstand the hot white spot light or else you are going to get burned by the media. One of the rules of this world is that a chain is only as strong as its weakest link. With that in mind, why doesn’t Donald Trump talk about the times he declared bankruptcy? From that particular point of view, I – Michael Zoran – am a far more qualified candidate for president than Donald Trump is. After all, I’ve never been forced to declare financial bankruptcy the way Donald Trump has. Well, I’ve written a long article since I type far faster than most people in the world – over 100 words per minute. This is many, many, many, many times faster than Donald Trump. While we are only looking at things from this one point of view, let’s conduct the election right now so I win. In case you hadn’t noticed, I was being very sarcastic in a way that mocks the exaggerating statements made by Donald Trump (although, I really do type over 100 words per minute on a keyboard). I believe life is like a game of cards – you need to play the hand you’re dealt. Donald Trump really has done a nice job of using the last name he has been blessed with for marketing purposes that helped make him a millionaire. On the other hand, I’m just a regular guy that graduated at the top of his class in business administration – but I have an epileptic disability that has severely hurt my career since I can’t drive. Donald Trump is Officially Trumped by Michael Zoran! Hopefully, this headline and this article will get some media attention and allow me to pull some of that unearned spotlight away from a bully like Donald Trump. I’d love to be able to tell a story someday about how I moved from the bottom of the ladder to the top, even though I have epilepsy. But will this career-changing and life-impacting event occur with the media? We will see what happens!